Kim Il Sung Square Sunday. 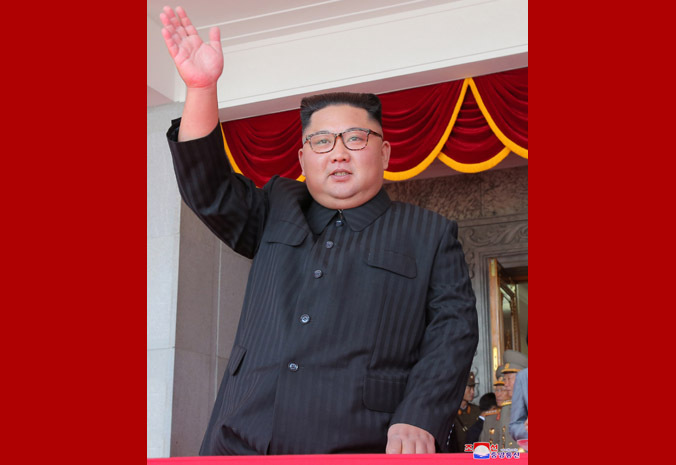 Kim Jong Un, chairman of the Workers' Party of Korea, chairman of the State Affairs Commission of the DPRK and supreme commander of the Korean People's Army, who is the Supreme Leader of the party, the state and the army, arrived at the square. The Supreme Leader reviewed the honour guard of the KPA services after receiving a salute from its chief. He appeared in the tribune of the square. Thunderous cheers of hurrah rent heaven and earth and fireworks of celebration were let off. He extended congratulations to all the service personnel and people on the 70th founding anniversary of the DPRK, warmly waving in return for the cheers of the participants in the parade and the procession. Taking the tribune and special seats around it were Kim Yong Nam, member of the Presidium of the Political Bureau of the Central Committee of the WPK and president of the Presidium of the Supreme People's Assembly of the DPRK, Choe Ryong Hae, member of the Presidium of the Political Bureau of the Central Committee of the WPK, vice-chairman of the State Affairs Commission of the DPRK and vice-chairman of the CC of the WPK, Pak Pong Ju, member of the Presidium of the Political Bureau of the CC of the WPK, vice-chairman of the State Affairs Commission of the DPRK and premier of the Cabinet, and other officials of the Party and government and leading personnel of the KPA. Present at the tribune on invitation were Li Zhanshu, chairman of the Standing Committee of the National People's Congress of the People's Republic of China, Mohamed Ould Abdel Aziz, president of the Islamic Republic of Mauritania, Salvador Antonio Valdes Mesa, first vice-president of the Council of State and first vice-president of the Council of Ministers of Cuba, Helal Al-Helal, deputy regional secretary of the Syria's Baath Arab Socialist Party and Valentina Ivanovna Matvienko, chairwoman of the Russian Federation Council. Taking the special seats were heads of a congratulatory group of Koreans in Japan, a delegation of the General Association of Koreans in China and a delegation of the International United Confederation of Koreans, heads of foreign party, state and government delegations, special envoys and personages. Delegates to the celebrations for the 70th founding anniversary of the DPRK, officials of the Party, military and government organs, the Cabinet, ministries and national institutions, service personnel of the KPA and the Korean People's Internal Security Forces, officials of institutions, factories and enterprises in Pyongyang, persons of merit, members of overseas Koreans' congratulatory groups and delegations, individual overseas compatriots , the chief of the Pyongyang Mission of the Anti-Imperialist National Democratic Front, members of foreign delegations, the diplomatic envoys, representatives of international organizations and members of military attache corps here, and foreign guests took the reserved seats. The guard of honor of all the services and the combined military band of the KPA began the opening ceremony. The chief of the General Staff of the KPA inspected the parade units. Kim Jong Un received a report from the chief of the KPA General Staff that the military parade for celebrating the 70th birthday of the DPRK would begin. Kim Jong Il", a salute of 21 guns was let off. Kim Yong Nam, member of the Presidium of the Political Bureau of the Central Committee of the WPK and president of the Presidium of the Supreme People's Assembly of the DPRK, made a speech. He said that the 70-year long history of the DPRK is the one of gigantic change and great victory in which it, once a backward country, has towered as a powerful socialist country with an invincible might. Referring to the fact that under the leadership of President Kim Il Sung and Chairman Kim Jong Il, the DPRK has been developed into a dignified people's country which embodies the Juche-oriented idea on socialist state building and into a fortress independent in politics, self-supporting in the economy and self-reliant in national defence, and that solid foundations have been laid for building a powerful country, the speaker emphasized that this is the most brilliant victory the Korean nation has achieved in carving out its destiny. He called upon all the people to strive for the eternal prosperity of the country and the accomplishment of the socialist cause, firmly united around Kim Jong Un. When the cars with the flags bearing the portraits of smiling President Kim Il Sung and Chairman Kim Jong Il entered the square, escorted by generals and officers of the KPA, the honour guard of the KPA services and all the paraders paid the noblest tribute to the great leaders. The military parade started off with three columns leading the way. The first column was of the officers of the Korean People's Revolutionary Army, the second of the cadets of the Central Security Officers Training Centre and the third of the 38th Guard Unit, the last two representing the service personnel who had defended the country in the post-liberation days for building a new Korea. They were followed by other units of the service personnel in the days of the Fatherland Liberation War, all holding their colours at the head of the columns--the Seoul Kim Chaek Guards 4th Infantry Division, the Seoul Ryu Kyong Su Guards 105th Tank Division, the Guards 2nd Torpedo Flotilla and the Guards 56th Pursuit Plane Group. Also marching past were the columns of the 1st Base of the Navy Command, the air force units, the military police unit of Panmunjom, an artillery unit under the 4th Corps, the Guards 1st Hero Brigade and the unit which had been seconded to the construction of the West Sea Barrage. Next came the columns of the Hainan Dao Front Unit, a unit of pilots and workers in the munitions industry. Striding behind them were the columns of the frontline army corps, Navy units, and Air and Anti-Aircraft Force units, Strategic Force units, Special Operation forces, Worker-Peasant Red Guards and Young Red Guards. Kim Jong Un waved back to the paraders shouting "hurrah!" on their march. Planes appeared in the sky, flying in the formation depicting the number "70" symbolic of the seven decades of the DPRK. The columns of mechanized units passed the square in tune with the song "Let's Support Our Supreme Commander with Arms." The parade was wound up with the military band portraying the letters Sung Ri (Victory) and the planes spraying three-colour smoke just above the square. Then, the public procession of the Pyongyang citizens began. The column in the shape of the national flag went past the square amid the playing of the songs "The Glorious Motherland" and "Ode to the Motherland," while the civilian participants on the square depicted the letters "Celebration September 9". There was a burst of loud cheers and excited waving when the column appeared of those holding flags with the statues of President Kim Il Sung and Chairman Kim Jong Il in the middle. It was followed by other columns of meritorious persons, families of service personnel, agricultural workers, sportspeople, Children's Union members, workers, scientists and teachers, each holding slogan-boards and other decorations. And then, amid the playing of the songs "We Will Follow Our Party Forever" and "We'll Travel One Road Forever", the columns of those holding the flags of the Workers' Party of Korea and the DPRK passed the square, demonstrating their resolve to follow the road of revolution to the end. When the procession ended, thunderous cheers were raised and fireworks set off. Kim Jong Un came out to the balcony of the platform and waved back to the cheering crowd.